When I think of travel and bucket listing, I generally think of traveling “everywhere,” not limiting myself. But there are a few times when my dedication to responsible bucket listing takes priority (for example, indefinitely delaying the floating sky lanterns list item due to its illegality in my area). So, when CNN Travel published an article titled “12 destinations travelers might want to avoid in 2018,” it made me reconsider my ideas of bucket list travel. It’s actually a very interesting read, and despite first appearances, it’s so much more than your everyday clickbait. Here’s the summary, in case you don’t have time to read the whole article. People who live, work, and govern several famous destinations are concerned with the large numbers of tourists that come every year (and in some places, every day). Because of these concerns, these places use strategies to reduce tourism. This could include charging access fees, putting limits on the total number of visitors, and adding restrictions like requiring guides or showing proof of return airline tickets. The article also makes suggestions for each of the places it lists, including tips for “if you must go” and similar alternatives if you choose to skip a place altogether. In general, recommendations seem to come down to respect for people and places when you travel, wherever you travel. But I realize that while individually, each person could be respectful, as a whole, the sheer number of travelers could still be overwhelming the culture, economy, environment, etc. It might be similar to “If everyone took only one flower from this garden, pretty soon, there would be no flowers left” (something my mom used to have to say to me). Because of this, I’m wondering where the line is regarding my individual responsibility and what to consider when deciding where I’ll travel. It’s something I’m still figuring out. What does “responsible travel” mean to you? What do you think about avoiding certain places because of the impact on that place and its people? Leave a comment. This entry was posted in Travel, Uncategorized Posts on April 13, 2018 by Shelly Najjar. 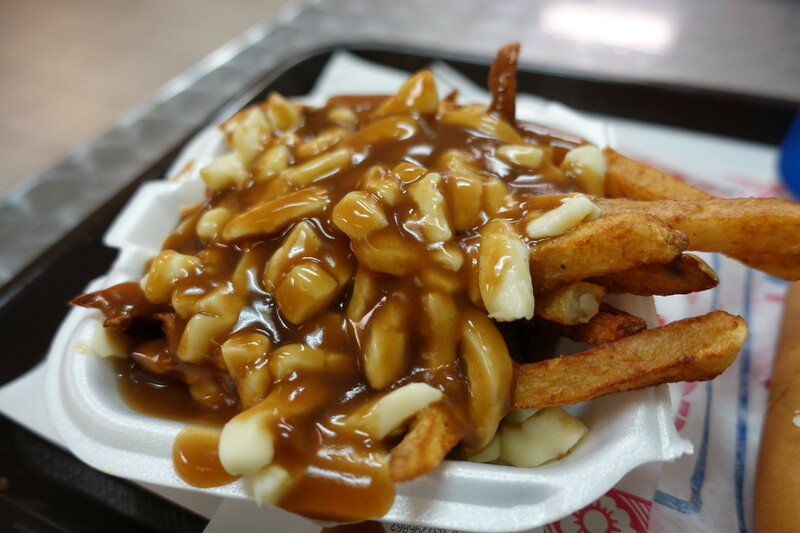 I love French fries, so I’m pretty excited about trying poutine, which people tell me is fries with gravy and cheese. Sort of like the concept of nachos, but with fries, and from Canada. That’s what I hear anyway. We’re at a bar at a ski resort in Idaho (but not to ski, story for another time). The Winter Olympics (hosted in Canada) are playing on the TV, and we sit with it in view. The server comes by and tells us they’re having some specials in honor of the Olympics, and hands us a piece of paper with several items, including poutine. Okay, the description doesn’t sound that great (because I prefer ketchup or Ranch on my fries, not gravy and cheese), but it’s unique and something that I haven’t tried yet. So… one order of poutine for the table, please! When it arrives, I pull out one of the fries hanging over the edge, and it comes out with a bit of gravy and some melted cheese. That looks promising, I think, because it reminds me of other melty-cheese foods I like. But, when I taste it, I’m not sure if I like it. I’m not sure why it’s weirding me out so much. Mashed potatoes have gravy, and baked potatoes have cheese. I love both. But this is different somehow. Maybe the fried taste with the gravy? The second fry has more gravy and I like it much less. This poutine adventure isn’t as great as I’d thought it would be. That’s sort of disappointing. But with the three of us, we eat most of them, until the rest are a soggy mess at the bottom, wallowing in the gravy (actually, those aren’t that bad, they’re more like mashed potatoes, but by now I’m pretty full, and this is a very salty food). So, while I’m grateful for the opportunity to try a new (to me) food, it’s probably the top way to ruin good French fries. But maybe it’s because I didn’t eat them in Canada. Either way, I’d be open to trying again, at least once. At least the receipt made it worth this first experience! Have you eaten poutine? Do you like it? This entry was posted in Reviews, Travel and tagged bar food, Canada, comfort zone, food, French fries, fries, Idaho, Olympic Games, Olympics, poutine, review, travel, try new things, winter Olympics on June 9, 2017 by Shelly Najjar.